Davis: Well, I'm glad to say I am joined by the Chinese Ambassador to this country, Liu Xiaoming. Very good evening to you, Ambassador. Thank you for coming in. Liu: Thanks for having me. Davis: Do you think your country, if the tables were turned, do you think China would let a British contractor build a nuclear power station in China? 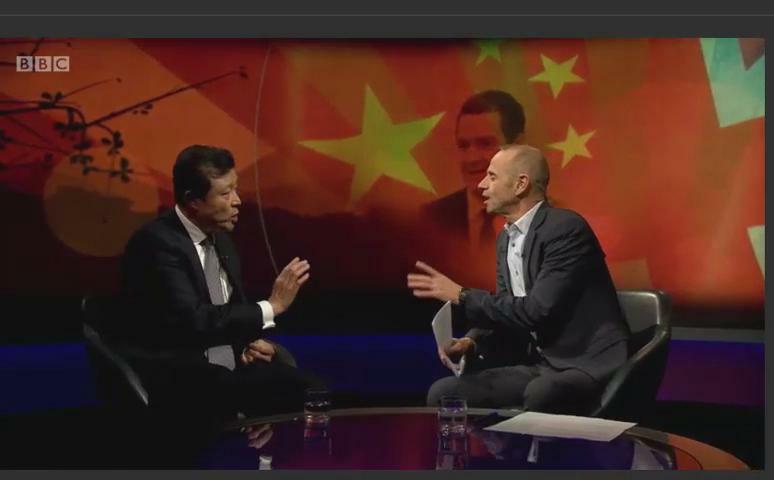 Liu: I would ask, do you have the capital, do you have the money to build nuclear power stations in China? Davis: Suppose we did? Do you suppose we did? Liu: Suppose? I am not sure about that. I think the reason why China is here, why you want China, is that you need Chinese investment. And also in term of technology, China is very advanced in term of nuclear technology. I think China has more nuclear power stations than many other countries. Davis: You are building lots of them and we can benefit from that. But I don't think we would. I mean, on your Government website there is a catalogue of prohibited foreign investment industries. It is more restrictive than ours. I mean, No.6, exploring, mining and dressing of radioactive mining products. No.9, smelting and processing of radioactive mineral products; production of nuclear fuel. You wouldn't let us go anywhere near your nuclear industry. I wonder whether you think we are stupid to let you come near ours? Liu: No, I think you are not stupid. In fact you are very smart, you know, using Chinese money to build your nuclear power station, and the British people will get benefit. If we can do that, we would love to do it. Davis: All right. It is win-win. Liu: It's win-win. I quite agree with you. Davis: … auction companies, antique shops engaging in antique, construction of golf courses. Why can't we build golf courses …? 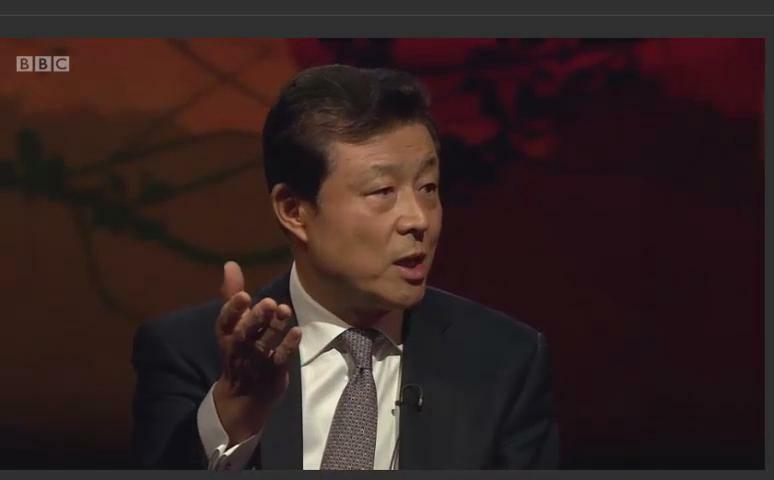 Liu: In fact there are several foreign investors building golf courses in China. What was the last time you were in China? Davis: Well, I just got this catalogue of prohibited foreign investments industries… Is this an out of date one? Liu: …so that the Chinese partners can help foreign business to get a feeling of the market. But you have to remember that China and the UK are at different stages of development. Just as your video clip said, you are more advanced in many areas and China is still a developing country. So we have to do things step by step. We have to learn your lessons. We try to avoid the mistakes you have made. So we have to be more cautious, when it comes to some of the areas of business. Davis: But I mean, it is a win-win trade and that's why we welcome you in. And we will let you do all sorts of things here. Sometimes it looks like it's not reciprocal. Liu: I don't think so. If we do not reciprocate, how could the UK become the second largest European investor in China, after Germany only? And your investment is also coming more and more. So I think it is win-win. Davis: Let me ask you this one. There are a lot of concerns, security concerns. In fact, the Times newspaper toady quoted security sources mentioning some of them, in relation particularly to nuclear power. There are fears that trap doors or back doors could be inserted into computer systems which might allow the Chinese to bypass British control of a nuclear plant, in the event of a diplomatic row. Now, how… is there any way the Chinese can assure those people in Britain who worry about that? Look, your plant is going to be safe and clean, and we won't have control. Liu: Of course, because we will do all this by following international standard. I think your intelligence people, your security people are not that stupid not to know all these things. You know, we are here for win-win cooperation, we are not here to try to control your nuclear power station. What China will get by controlling British nuclear power station? I think you'd have to see there is a basic trust, when you are forging partnership. So I think if this bad media keeps playing up, China's business might be scared away from entering the UK. It would just be opposite to what you Chancellor has been saying the UK will be the most open western country to Chinese investment. Davis: But basic trust? Is there a basic trust? I mean what about this People's Liberation Army Unit 61398 building in Shanghai, out of which a very large portion of the cyber crime … Is this nonsense? Liu: I think that is a hyped rumour. First of all, I want to let you know that the Chinese Government strongly opposes this kind of practice. During President Xi Jinping's visit to the United States, the two Governments reached consensus that the two countries will work together to fight against this cyber crime. We are committed that none of the Government agencies will be engaged in cyber espionage, and none of the Government agencies will be in support of such activities. Liu: If you don't believe us, how can we work together and build partnership? Davis: But I have been … Your own book, the Science of Military Strategy, the PLA's own manual 2013 version, which was leaked out, did acknowledge that China has network attack forces. I mean, what is the network attack force? Liu: I don't believe this. I don't think we have any cyber attack forces. China is more open for cooperation. In fact China itself is a victim of hacker attack. Liu: And in China, we have a saying, Confucius philosophy, I'm sorry to drag you 3,000 years back. "Do not do to others what you don't want them to do to you." That is our philosophy. We follow this philosophy. You know, since Chinese are victims of hacker attack, we don't want to inflict the same attack onto others. Davis: Look, very briefly, human rights. If Britain makes a big fuss about human rights next week – if there is a big protest, suppose the opposition leader, suppose the Prime Minister talks a lot about human rights and our version of it – will we have a price to pay in trade and investment? 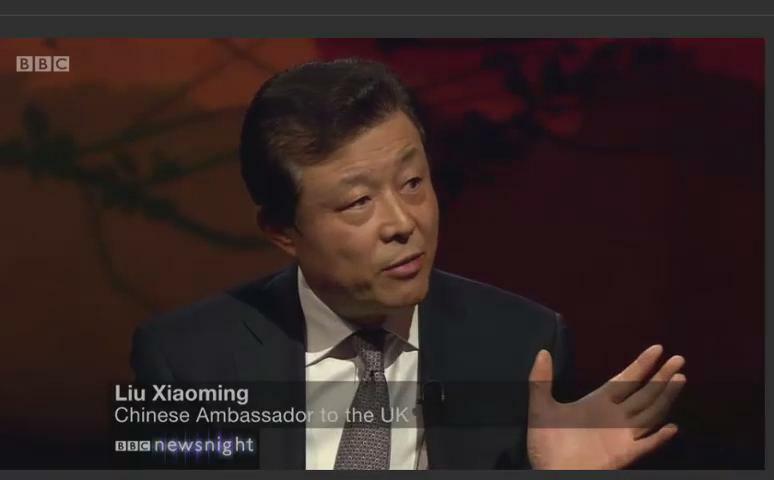 Liu: First of all, I would ask you this: do you think human rights are perfect in the UK? That's number one. Secondly, do you think UK's model is perfect worldwide? I think every country has its own conditions - how to improve human rights, how to protect them. Do you agree with me? Liu: What is your definition of human rights? Davis: I am not criticising your human rights. Sorry, my question wasn't about your human rights. The question was, if we criticise your human rights, and you can criticise ours, will we pay a price…? Liu: Is that what our President is here for, criticising each other on human rights? Liu: That is not our way of doing things. Davis: He is not gonna do that, I know. Liu: We respect the conditions of other countries. We think human rights are basically guaranteed by Chinese constitution, protected by the constitution, and it's really an internal matter to begin with. Of course, I hope you would have a big picture of human rights in China. Davis: I am not getting into an argument about human rights. My point is about trade, and whether you use trade as a way to stop us talking about human rights. Liu: So you think we use trade as a vehicle or weapons to get things we want? That is absolutely wrong. Trade is win-win. We export what you need, and import what we need. You know, there is no so called quid pro quo in terms of trade. In trade, I think it is a win-win. Davis: So we should carry on trading even if we sometimes have a disagreement over human rights. Liu: I agree. China and the UK are so different in social systems, both political and economic, in history and in culture, different stages of development. We differ. That is natural. You know, but we can still do business. And we can reserve our differences and seek common good. Do you agree with me? Davis: I do agree with you, I do. I am glad we agree. Just one, very quick last one. Our Health Secretary spoke about his Chinese wife, and the working values in Asia. He said we want to be a country that can work hard in the way the Asian economies do. Do we have a good work ethic here or do we have benefit levels that are too high …? Liu: I think the two countries can learn from each other. The Chinese people are working very hard, but the British people are very creative. So the two peoples can learn from each other. Liu: Not as hard as the Chinese people. So that's how China can make a miracle, just in 30 years, to turn a relatively poor country into the second largest economy. I think we should give a credit to the hard-working spirit of the Chinese people. Davis: In 40 years time do you think China will look more like Britain? Do you think there may be a democratically elected President? Liu: So that's where we come to the basic of difference here. You believe yours is a democracy. We think our system is a democracy. We call it democracy of Chinese characteristics. When other people look at the UK, your system, you know, the way you elect your national leaders, it's not direct election. In China, it is also indirect election. We elect the county deputies, the county deputies elect the provincial deputies, then the national deputies, then the national leaders. Liu: We can spend the whole evening talking about democracy. Davis: Ambassador, thanks for coming. 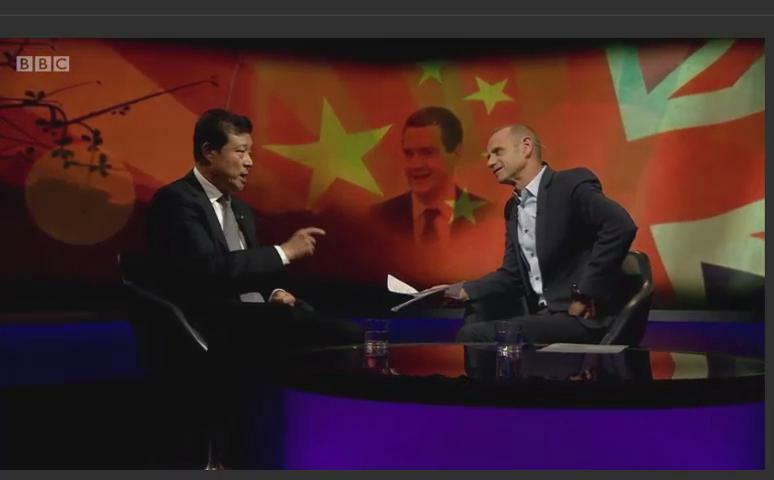 Newsnight is a popular BBC 2 programme which specialises in in-depth analysis into current affairs and robust cross-examination with senior politicians. Evan Davis, economist, is Newsnight's lead presenter and economics editor, the most senior economics post at BBC.